For one thing, we ended up hopping a fence. no, seriously. we hopped this fence. That’s not ’til the middle, though; allow me to back up a bit. (WARNING: rocks ahead. I’m being serious! Also, lots of pictures. Carry on, then! )Saturday’s alarm sent me straight to the kitchen because, tea. I mean, you know. Priorities. We — “we” being myself and some of my new friends: Eileen, Lis, and Tyler — had been by some of the pubs the night before and while I stuck with my single cider, the lateness of the hour and the little sleep that did happen before I got up at 8 combined to make me rather less than my typical, overly-chipper morning-person self. In any case, Basia’s magic tea once again assisted in reviving me to my normal levels of cheeriness at what my friends still deem ungodly hours of the morning, and the adventures were able to actually begin (yes, the fence, I know, I’m getting there!). Said friends, along with a new friend (Annabel, from Australia! 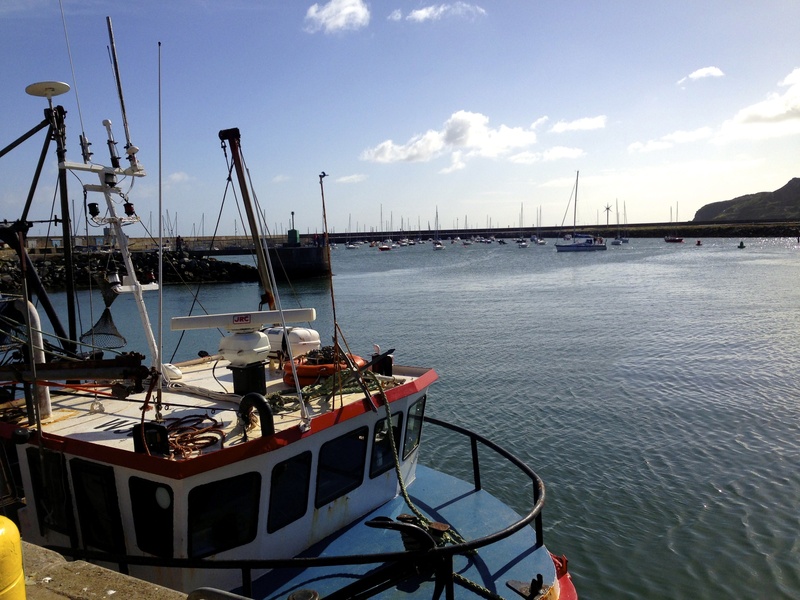 ), hopped on the DART and headed for a day’s worth of fun at Howth, a peninsula at the northern tip of Dublin Bay. You know that game of word association that people play sometimes? Like, I say one word and you say the first thing that comes to your mind? 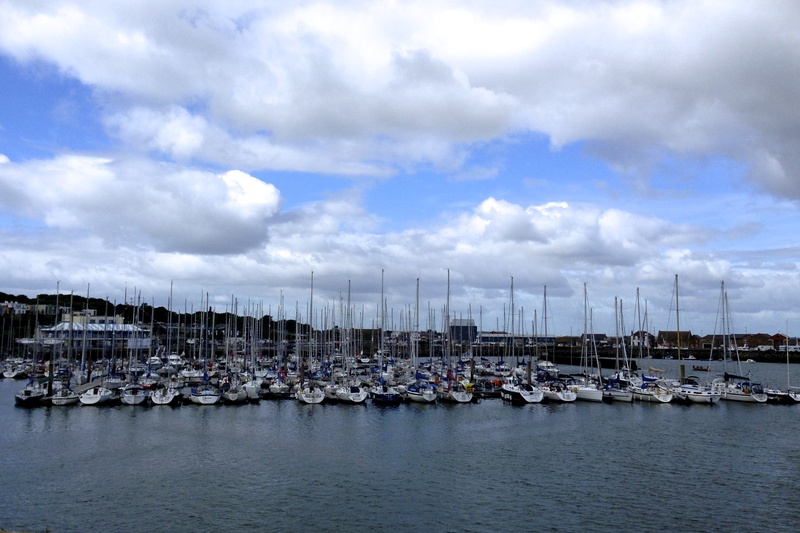 Well, if you said Howth, the first thing I would think of would probably just be… wow. Just — wow. And those are only from the Eastern part of the harbour. 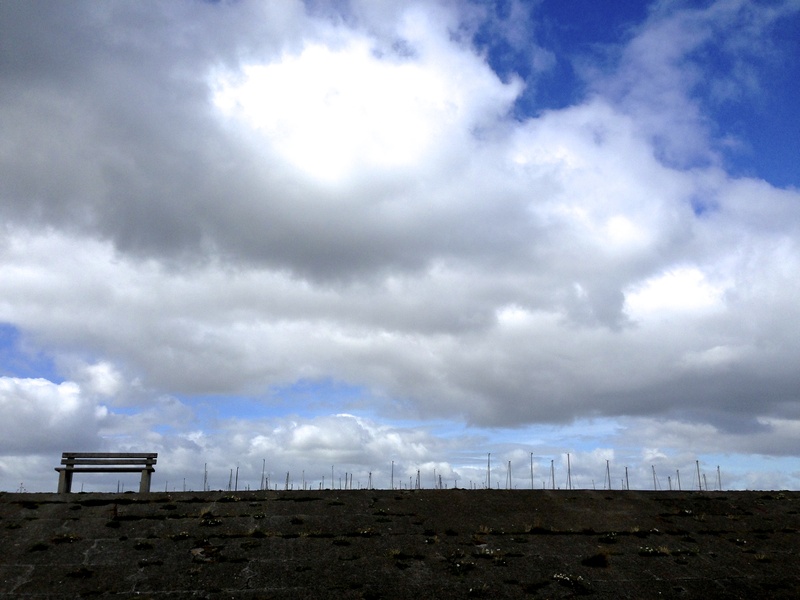 We walked its length, awed by the sheer blue everywhere: sky, water, buildings. 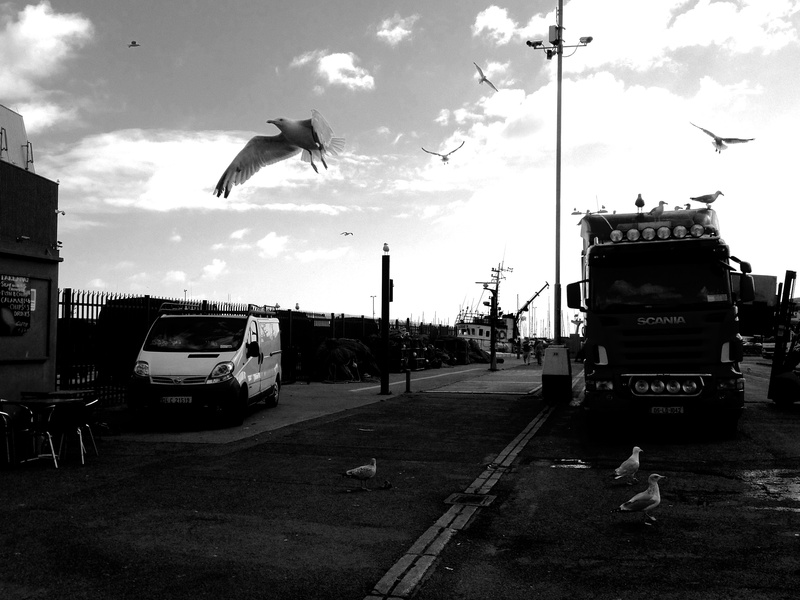 The gulls were everywhere, the air smelt strongly of brine and slightly of fish, and there are boats all over the place. 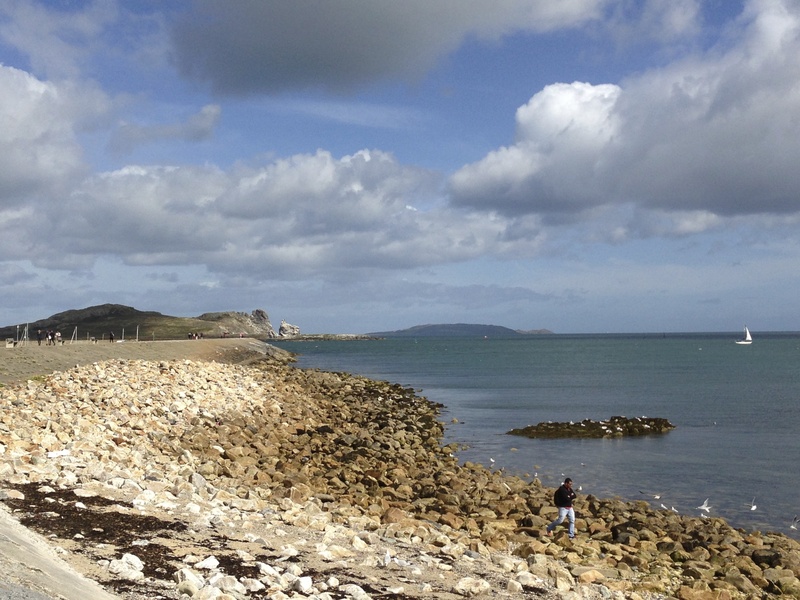 I don’t know if I’ve seen anything so beautiful as Howth (not even the coasts of Maine or Washington). In any case, we spent a good amount of time staring and soaking in the beauty of it all. 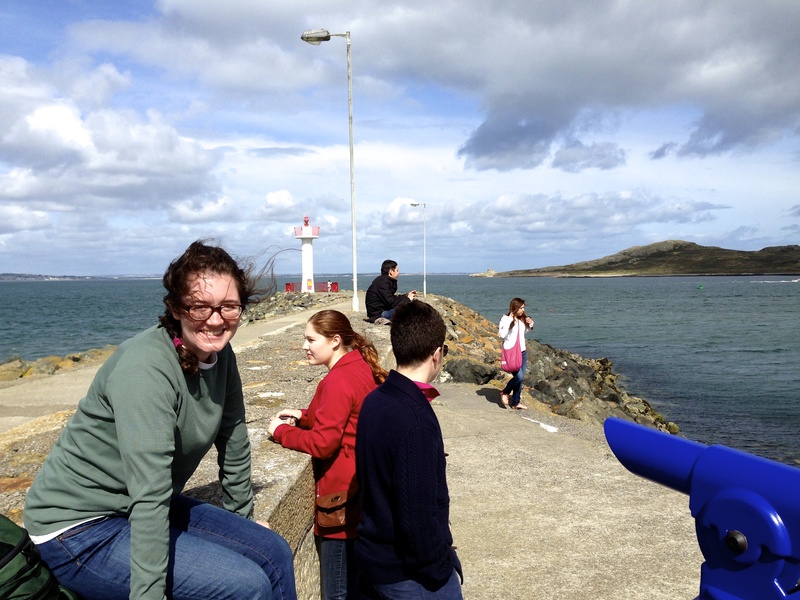 Eventually, we decided to wander towards the Western edge of the harbour (with a quick pit stop by the Howth Market, which is basically a farmers’ market across the street. I bought tea. Naturally.) 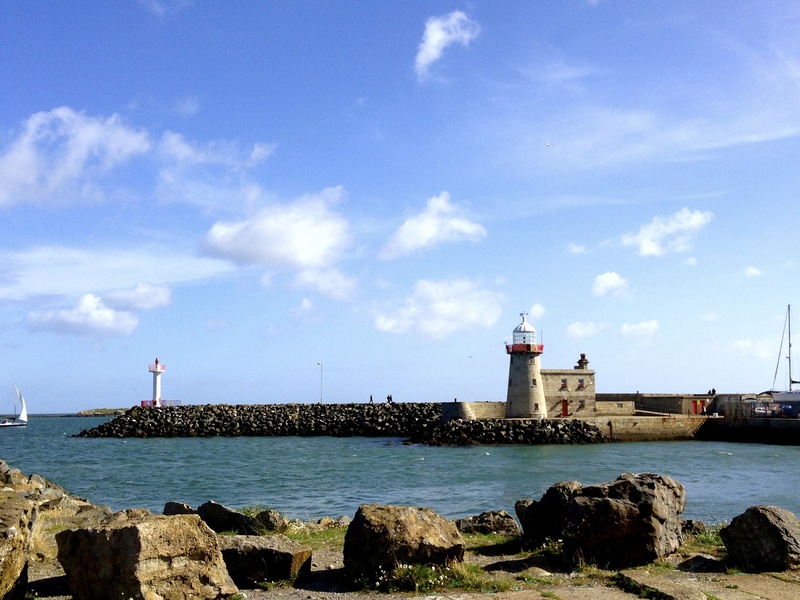 and get closer to the lighthouses. We climbed over the beach, admired the kelp and the smoothness of the rocks, walked to the tip of the harbour pier, and I took a whole lot of pictures because everything is just. so. beautiful. yes, I am here… I promise! The lighthouses are absolutely lovely. The island in the back of that last picture is called Ireland’s Eye. Shortly after this, we headed back to the train station for lunch — specifically, the tea room next to the train station. We all ordered tea, and it came in these beautiful pots (one each)! I bought some seafood chowder for lunch, and let me tell you: de. lect. a. ble. 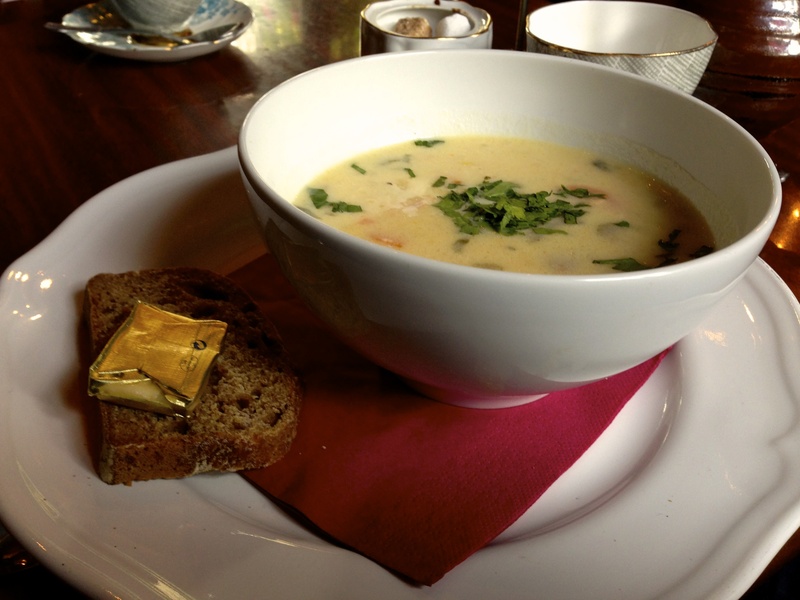 I had never considered salmon a fish meant for chowder, but the Blue Dog and its delicious recipe have convinced me that salmon is, in fact, the perfect fish for chowder. You know, people always talk about Irish cuisine as being blah and bland due to potatos and such, but all I’ve found since I arrived is delicious, freshly grown or made or butchered food — and oh, the seafood. The benefit of island life, I suppose. Irish butter is in a category of its own. Compared to it, American butter tastes like Crisco. Annabel left us after lunch due to previous arrangements. The rest of us took another look at the map, realized we’d only seen the harbor and that the peninsula was at least twenty times larger, and immediately set off to adventure. Per Eileen’s request, we visited the ruins of a church; per mine, the more in-tact-and-still-used Church of the Assumption, & after all of this we climbed up a hill towards what ended up being the Museum of Vintage Radio (which had an admittance fee, so we decided against that particular attraction). 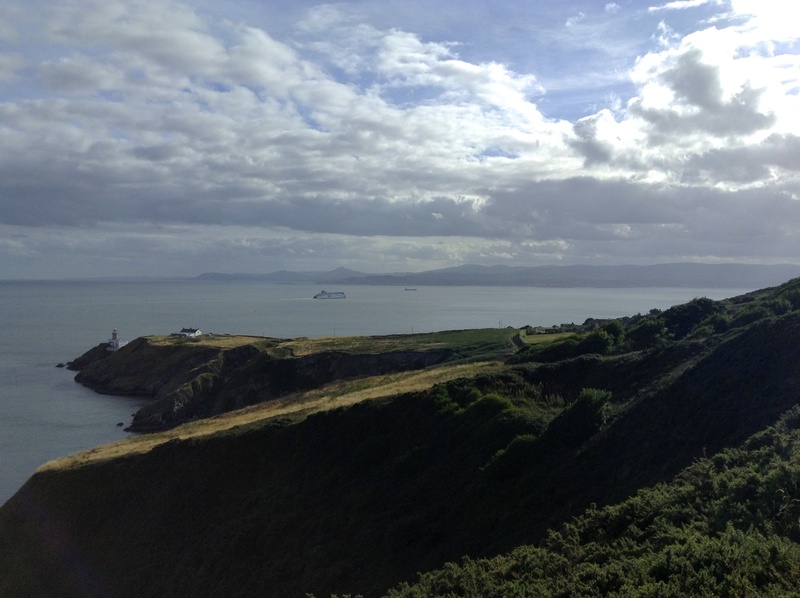 Instead, we wandered the hillside, staring at the panoramic views of Howth and the Irish Sea, half-dozing in the sunshine (which explains the sunburn), figuring out where to go next. See, it was the most direct route down to the road that had the gate that led to the stairs that led to the beach (try saying that five times fast). So, when Eileen jokingly suggested that we hop the fence and scurry down the hillside — instead of walking an extra 1.5 km down the hill, around the next three blocks, and up the next hill — Lis decided it would at least be worth investigating the possibilities, had a look, and hopped the fence. We followed, of course — group solidarity! No one gets left behind! 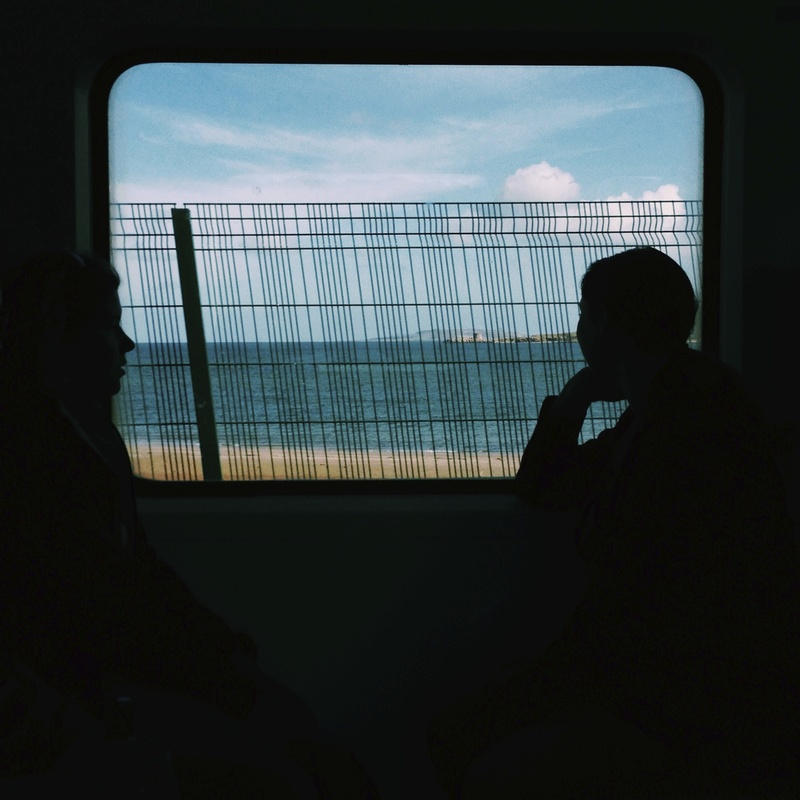 — and down we went. The beach was lovely: all rocks and skipping stones and seaweed, seaweed, everywhere (and not a bite to eat?). We saw large rocks to our right and, when Lis mentioned she’d seen another staircase indicated on the map just past the rocky ramble, off we set! 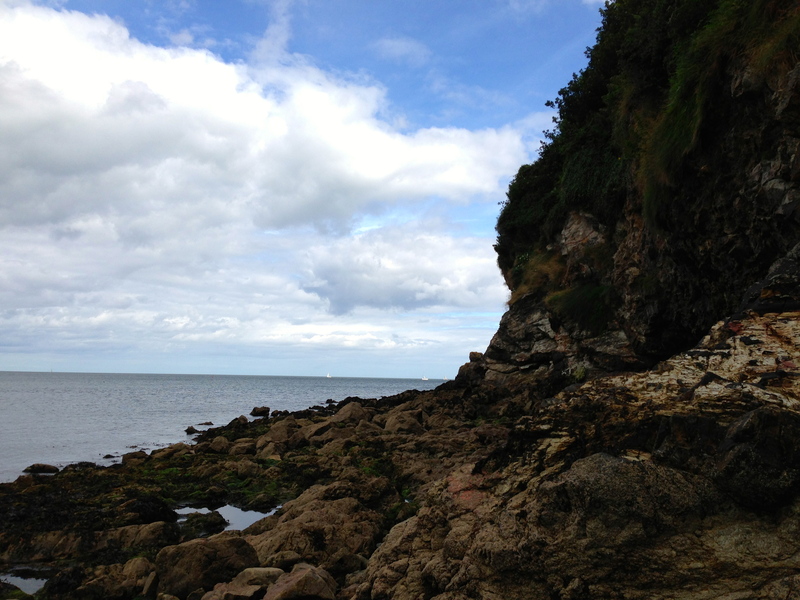 And that, my friends, is how I set foot in the Irish Sea… literally. No, seriously. My left foot slipped and ended up in a tide pool at one point. Then we rounded a corner and found a waterfall. No, I’m not kidding. That’s Ireland for you. One second, you’re scrambling over rocks to get to ruins around the corner, the next you’re stopped to stare at a waterfall, and the third you’re scrambling back over the rocks because the way is shut… it was made by those who are — sorry, right. This is my life, not Lord of the Rings. Still, the way was shut — there was a solid wall at the top of the stair that read NO ENTRY // BEWARE OF DOG, so we hightailed back towards our starting point & began our wander towards the cliffside hike. And oh, the views. 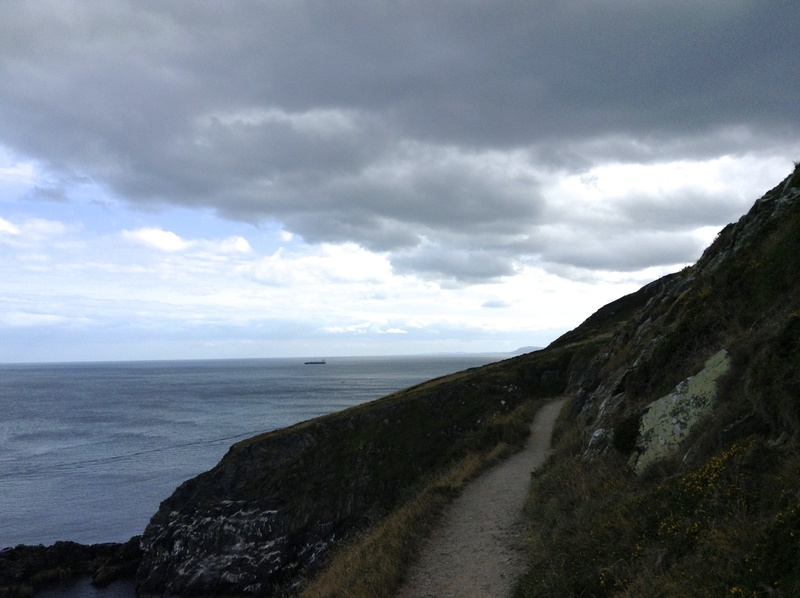 If you’re ever on Howth and don’t mind heights, do the cliffside hike. 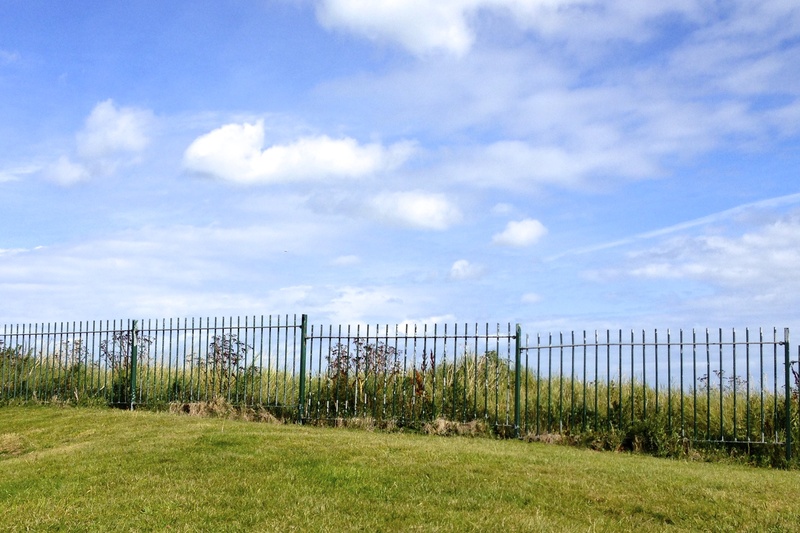 The path takes you up to the peaks of Howth itself, giving you amazing views of the peninsula and, once you reach Howth Summit, the other side of Dublin Bay! Plus, there are blackberries everywhere. 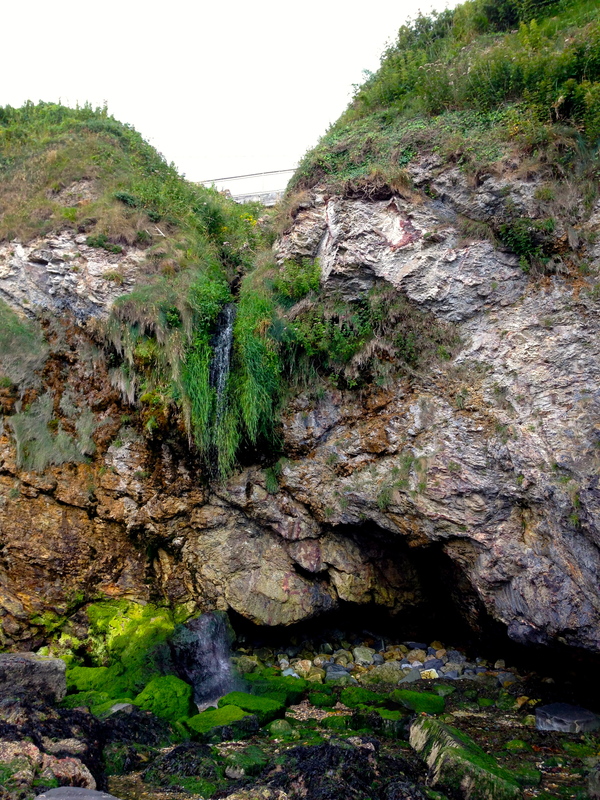 The cliffside hike is arguably the most beautiful part of the island. 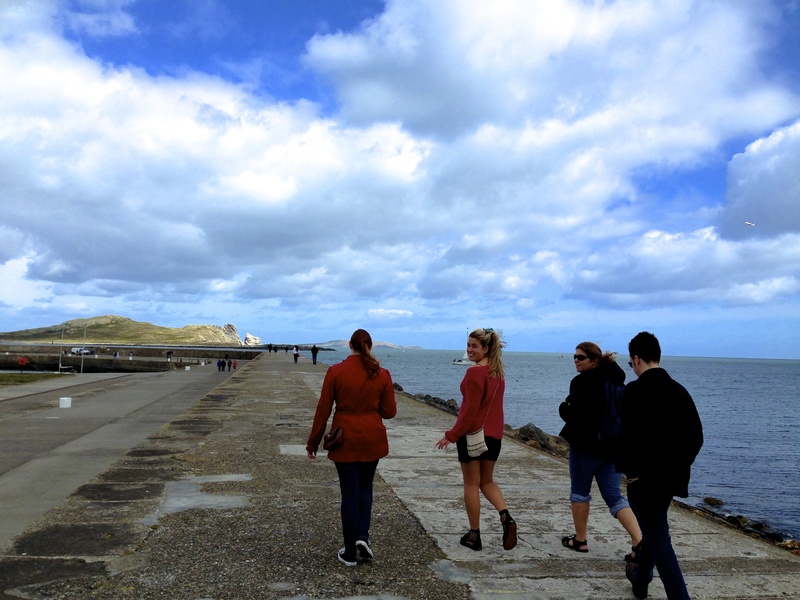 And so it was that, after at least four hours of hiking and another two of wandering around town/the harbour, the four of us headed back towards the train station for some much deserved ice cream and tea before our trip back to halls (that’s what they call dorms here, apparently). We arrived home, cleaned ourselves up, grabbed a pint of cider (no, seriously, all four of us ordered cider), and dragged ourselves through a late-night grocery store that had almond milk!!! and back to the dorms for a lovely, lovely night of sleep. All in all, I’d have to say that my first “trip” since arriving was a solid success! 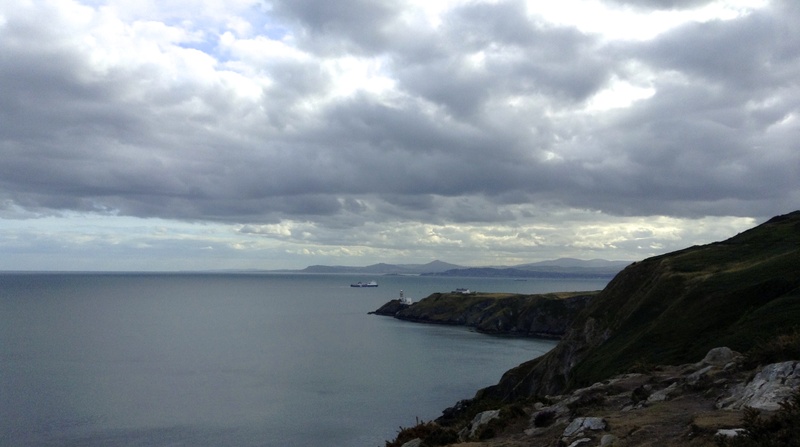 This entry was posted in a semester abroad and tagged amusing adventures, dublin, hiking, howth, ireland by connor grace. Bookmark the permalink. Wonderfully told, Connor! I can’t express how much you’re making me long to return. It’s my not-so-secret goal to get as many people as possible to come to Ireland (including you and my family, of course)… glad to see it’s working at least in part? 🙂 Thanks, Joel!